The Index opened weak and went on to touch the lows at 8145 within the first hour of trade; the subsequent pullback was again sold to the lows. Short covering rally saw the index close nearer to 8200 at 8181.50, still a huge loss of 58.25 points. The broader market was also negative, with 661 advances to 823 declines. Developing Range as per Option Table is 8100-8800. 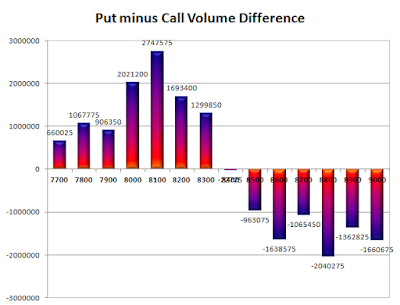 Call option 8200-9000 added huge 48.10 lacs OI with some more addition at lower levels. 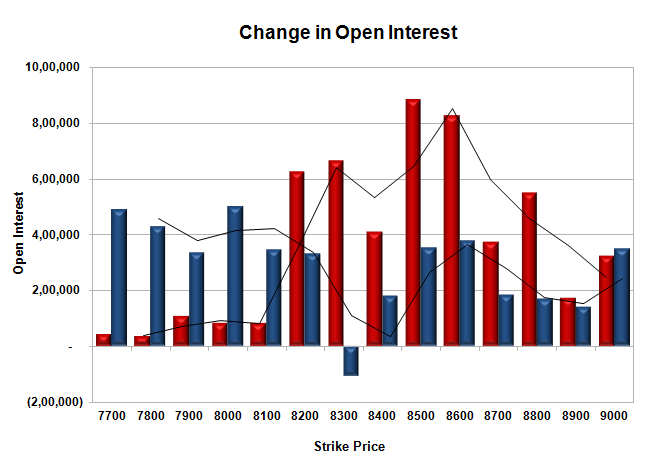 Put option 9000-8400, 8200-7700 added huge 41.67 lacs OI with short covering seen at 8300 strike prices. Nifty Open Interest is at 1,89,24,450 up by 59,50,900, with decrease in price, most probably 100% rollover with huge short build-up. Bank Nifty Open Interest is at 16,07,650 up by 6,06,175, with small increase in price, most probably 100% rollover with some long build-up. FII’s sold 6.49 lacs Futures, which includes 182578 contracts long liquidation and 126609 contracts short covering, with decrease in net OI by 309187 contracts (includes 253196 longs to 279163 shorts for the day) and the Average Price comes to 8614.48. FII’s Index future open contract as on date is 382402 Longs to 170697 Shorts, net long 211705 down by huge 55969 contracts. Initial support at 8200, with OI of 26.19 lacs and below that at 8100 with highest OI of 29.37 lacs. 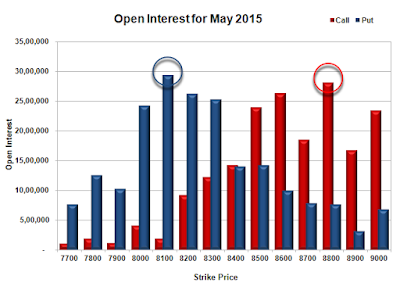 Initial resistance at 8300, with huge OI addition of 6.61 lacs and above that at 8500 with OI of 23.92 lacs. Day Range as per Option Table is 8100 - 8278 and as per VIX is 8108 - 8255 with 8185 as the Pivot.